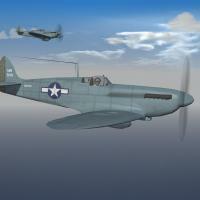 This pak contains 2 versions of Photo Recon Spitfires as used in the ETO in WW2. By inference, the PR.XI may also have been used in other theatres, MTO and/or PTO (CBI), but research has not turned up any confirmations of CBI usage. The PR.XI comes with 2 skins, one tagged (genericlly) for 1 PRU squadron, although research has shown they were also used by No.541 and/or No. 542 Squadrons. The other for the 17th PRS, 7th PRG of the US 8th AF. Serial numbers for the AAF skin are 100% historically accurate. The 2 RAF skins serials are more 'generic' in nature. 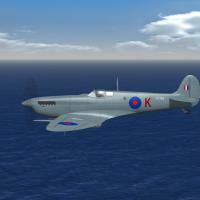 All aircraft are finished in PRU Blue (FS matched as close as possible). The PR.IX uses all decals for marking; the PR.XI has the national markings painted on, but serials are decals. 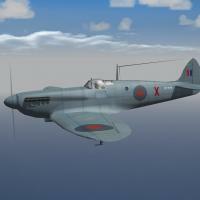 This will diferentiate them for any/all other PR Spitfire that may exist. The FR.IXC, by it's very name, retains all it's fighter armament, and 'carries' only the the single oblique camera. The PR.XI is completly unarmed, but retains (non-historically) it's cockpit gunsight. Weapons (drop tanks), pilot figures (included 'fake pilot' center pylon for the PR.XI) and the AvHistory Merlin sound are included.